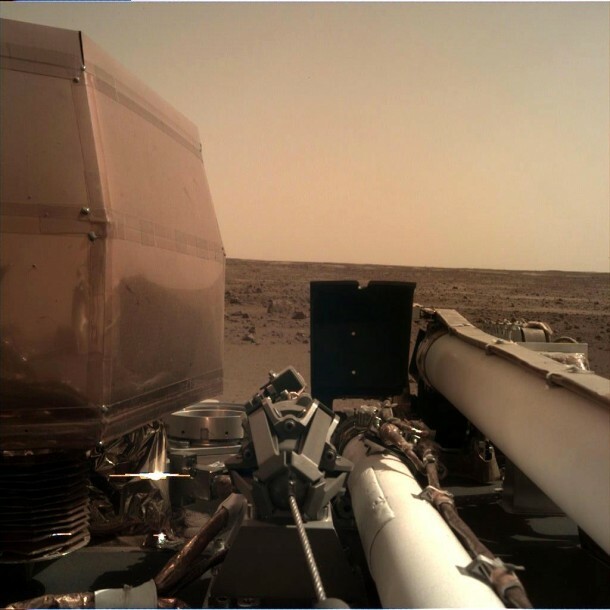 NASA’s InSight has sent signals to Earth indicating that its solar panels are open and collecting sunlight on the Martian surface. NASA’s Mars Odyssey orbiter relayed the signals, which were received on Earth at about 5:30 p.m. PST (8:30 p.m. EST). Solar array deployment ensures the spacecraft can recharge its batteries each day. Odyssey also relayed a pair of images showing InSight’s landing site. InSight’s twin solar arrays are each 7 feet (2.2 meters) wide; when they’re open, the entire lander is about the size of a big 1960s convertible. Mars has weaker sunlight than Earth because it’s much farther away from the Sun. But the lander doesn’t need much to operate: The panels provide 600 to 700 watts on a clear day, enough to power a household blender and plenty to keep its instruments conducting science on the Red Planet. Even when dust covers the panels – what is likely to be a common occurrence on Mars – they should be able to provide at least 200 to 300 watts. In the meantime, InSight will use its weather sensors and magnetometer to take readings from its landing site at Elysium Planitia – its new home on Mars. NASA’s Interior Exploration using Seismic Investigations, Geodesy and Heat Transport (InSight) lander successfully touched down on the Red Planet after an almost seven-month, 300-million-mile (458-million-kilometer) journey from Earth.